The wild card to consider when looking at these times: the degree of difficulty on the bike course. 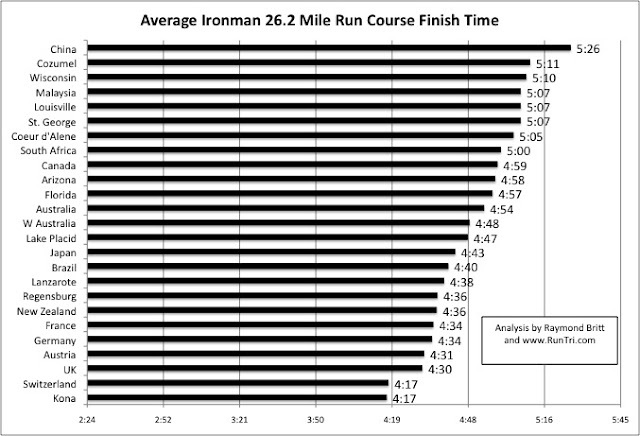 A 5+ hour marathon on the St. George course probably has a lot to do with it's toughest 7-hour bike ride. China's course features the toughest marathon; however, the race will be on a new course in 2011. Austria and New Zealand have comparable, relatively easier bike courses, and as a result, legs may be fresher to run faster marathons. More interesting is to note that Florida, Arizona and Lake Placid marathons are nearly identical. Madison as the toughest marathon? Having raced 8 of these events personally, I'd agree.